FIGHTFORFLINT.ORG FIGHTFORFLINT.ORG When an earthquake destroys a major city, we rally. We don’t blame those caught in the rubble, we help them. We don’t pull our investment, we rebuild. We don’t judge, we pray. Over the past 30 years, an economic earthquake hit Flint, robbing far too many of hope. When an earthquake destroys a major city, we rally.We don’t blame those caught in the rubble, we help them. We don’t pull our investment, we rebuild. We don’t judge, we pray. Over the past Dwight Ezop, 30 years, an economic earthquake hit Flint, robbing far too many of hope. Editor of Faith Magazine It’s time we rally. When the water crisis broke in 2016 Flint was hit with yet another devastating blow. 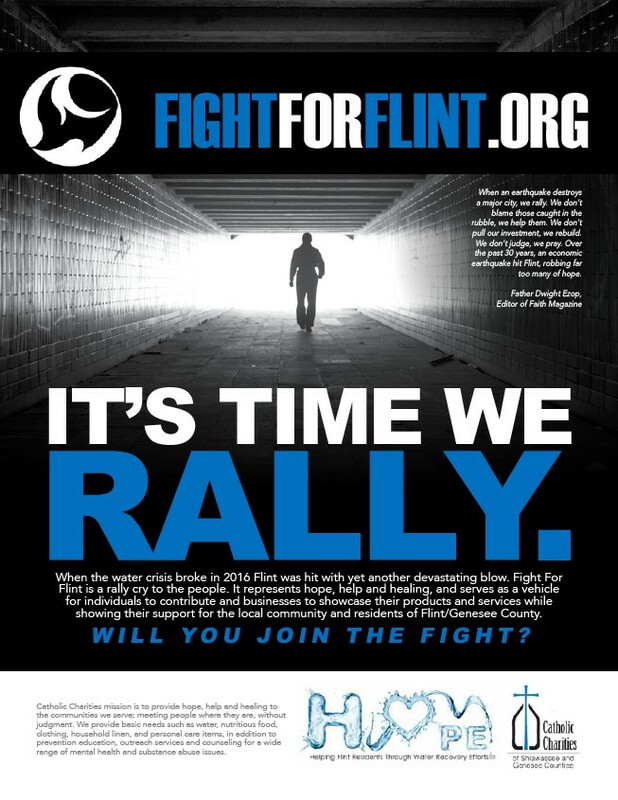 Fight For Flint is a rally cry to the people. It represents hope, help and healing, and serves as a vehicle for individuals to contribute and businesses to showcase their products and services while showing their support for the local community and residents of Flint/Genesee County. Will YOU join the Fight? When the water crisis broke in 2016 Flint was hit with yet another devastating blow. Fight For Flint is a rally cry to the people. It represents hope, help and healing, and serves as a vehicle When the Flint is for water a rally individuals crisis broke in 2016 Flint was hit with yet another devastating blow. Fight For cry to the people.to It represents contribute hope, help and and businesses healing, and serves to as showcase a vehicle their for products individuals to and contribute services and businesses while to showcase their products and services while showing their support for the local community showing and residents their of Flint/Genesee support County. for the local community and residents of Flint/Genesee County. Will YOU join the Fight? Catholic Charities mission is to provide hope, help and healing to the communities we serve; meeting people where they are, without judgment. We provide basic needs such as water, nutritious food, clothing, household linen, and personal care items, in addition to prevention education, outreach services and counseling for a wide range of mental health and substance abuse issues. Dwight Ezop, Editor of Faith Magazine It’s time we rally. Catholic Charities mission is to provide hope, help and healing to the communities we serve; meeting people where they are, without judgment. We provide basic needs such as water, nutritious food, clothing, household linen, and personal care items, in addition to prevention education, outreach services and counseling for a wide range of mental health and substance abuse issues. Catholic Charities mission is to provide hope, help and healing to the When an earthquake destroys a major city, we rally. We don’t blame those caught in the rubble, we help them. We don’t pull our investment, we rebuild. We don’t judge, we pray. Over the past 30 years, an economic earthquake hit Flint, robbing far too many of hope. Father Dwight Ezop, Editor of Faith Magazine IT’S TIME WE RALLY. W I L L YO U J O I N T H E F I G H T ?